Agreement between UC and the Chinese Academy of Social Sciences opens doors to further cooperation and exchange | Notícias UC | A UC como nunca a viu. The University of Coimbra (UC) and the Chinese Academy of Social Sciences (CASS) signed a memorandum of understanding this Friday, 26 October, which will open doors to stronger cooperation links and exchange opportunities between the two institutions. “It’s the beginning of a collaboration on which we’re pinning great hope”, underlines the Rector of UC, João Gabriel Silva, during the ceremony of the signature of the agreement between the two institutions. This agreement is the result of the growing rapprochement between the University of Coimbra and the People’s Republic of China in the last recent years, which is reflected in the creation of the Confucius Institute of the University of Coimbra (2016), the strengthening of academic partnerships with Chinese universities, the development of information channels in Chinese about UC, the award of academic scholarships, the organization of a growing number of scientific events and the recent creation of the Sino-Lusophone Academy. CASS, the main Chinese think tank, “is a fundamental institution in what concerns the production of knowledge about China” and it can play a “decisive role” in the future cooperation of UC with this Asian country, states João Gabriel Silva. 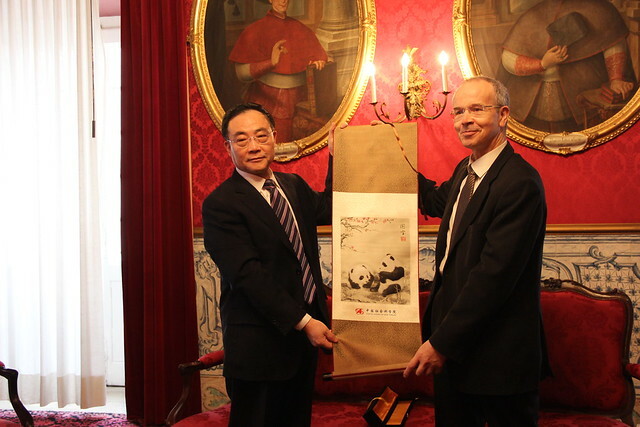 Wang Jingqing, CASS vice-president and senior top manager in the Chinese government, shares the same views about this collaboration: “This memorandum of understanding will open a new page and strengthen the cooperation and exchange between the Chinese Academy of Social Sciences and the University of Coimbra”. “Our school hopes to work together with the University of Coimbra to provide intelligence on the cooperation between China and Portugal and on the broader strategic partnership involving both countries.”, added Wang Jingqing. “We’re sure that together we’ll better fulfil our common mission of putting the knowledge at the service of our countries in an increasingly globalized and interconnected world”, said João Gabriel Silva.